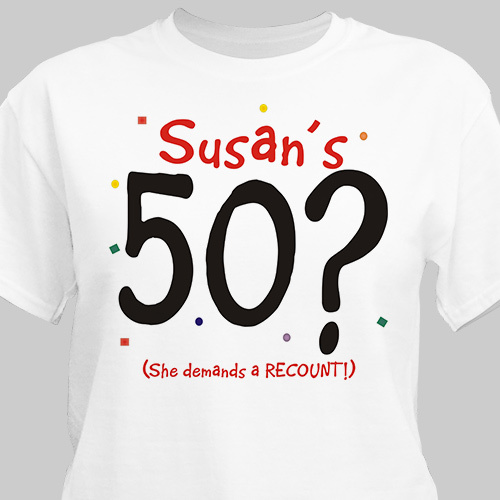 Let everyone know you're not sure how old you are with our Demands A Recount Birthday Personalized T-Shirts. Everyone will enjoy this fun, novelty 50th Birthday Tee Shirt celebrating your special day. Our Birthday Personalized Shirt is available on our premium white 100% cotton Personalized T-Shirt, machine washable in adult sizes S-3XL. Includes FREE Personalization! Personalize your Birthday T-Shirt with any name and age. Please indicate He or She. I was happy with the 50 t shirt. GiftsForYouNow.com offers a large assortment of Personalized 50th Birthday Gifts. We have Personalized 50th Birthday Frames, Personalized 50th Birthday Shirts & 50th Birthday Keepsakes. Our Personalized Birthday Frames are great to give to close friends & family.